With the pre-holiday swimwear sewathon in full swing I realised that if A and I were both going to have bikinis - a lifelong dream of hers, we would need some sun protection too. Enter the Jalie Valerie (3668) pattern. 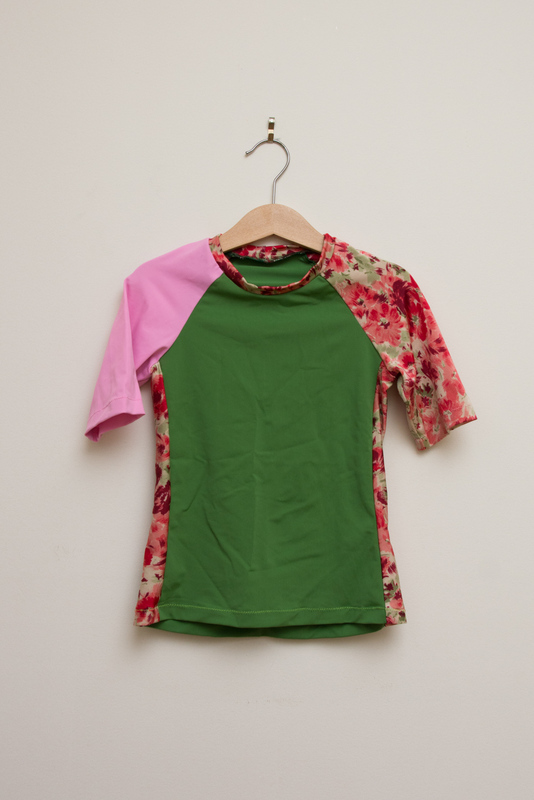 A raglan sleeve rashie with various sleeve lengths, cropped or regular body length and the option to insert a front zipper. So, if A was getting her full dream realisation she would have had the cropped torso version, but that doesn't give the sun protection she needed so was nixed. Sorry kid. I'd actually traced off this pattern for both kids last summer but never got around to making them. I stuck with the size I'd traced, J width and L length as that's what her more recent leotards had been. The body fit is fine and the sleeve length is super generous, but this kid always seems to need more torso length and she does, much to her delight, get a little bit of her tummy exposed. 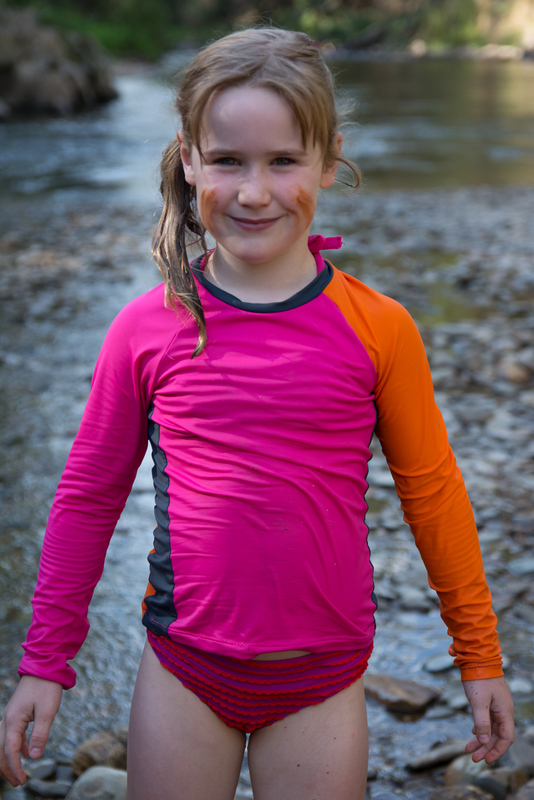 The colours were chosen to try and co-ordinate with her new bikini (apparently the BEST thing I've ever made her and yet to get it's blog feature). The three fabrics are all the Carvico VITA recycled lycra from my stash. I figured I could make another and use up some too small for anything else remnants of swimsuit lycra with some more colour blocking. The sleeve length on this one was determined by how much of the floral fabric was left. The pink and green are Carvico VITA. It hits just above the elbow and is perfect. Mine was size V as per my measurements with no alterations to the pattern until I'd made it up. Then I trimmed about 4cm off the sleeve length before hemming them. They really are generous sleeves as I'm normally one who either adds length or is barely satisfied with long sleeves. This is a great rashie pattern for us girls (and probably P really) but to avoid the feminine waist shaping I might have to pick up Jalie's men's raglan T-shirt pattern to use as a rashie for Flipper. But he can wait until next summer, there's more for the girls first! These are great suits! I love the mismatched sleeves. And I'm so jealous of your amazing swimsuit fabric. I need to figure out how to get my hands on some. All the fabric I buy here disappoints. I can recommend that Jalie men's raglan pattern! I made a rash vest out of it for my husband before *our* vacation last summer. Oh thank you. I'm coming around to the belief that I can't really go wrong with Jalie patterns. Your swimwear sewing is simply inspiring! THanks Jenya. It's surprisingly easy and very rewarding. You just need to dive in! Another great swimsuit and the fabric sounds amazing. Yet more awesome bathers. You don't do things by halves, do you! As for the cruel dashing of A's crop top dream, R asked for off-the-shoulder bathers. I did not oblige! Cheers Marisa! I do like to get on a roll, but I've stopped for a bit of cotton dress and shirt stitching before making the last two swimsuits of the summer.